If you can believe it, Thanksgiving is just around the corner. It seems like it was just yesterday that you were dressing your dog up for Halloween, and now it is already time to prepare the turkey dinner. This year, let your dogs get in on the holiday family fun by preparing special Thanksgiving dishes for them. 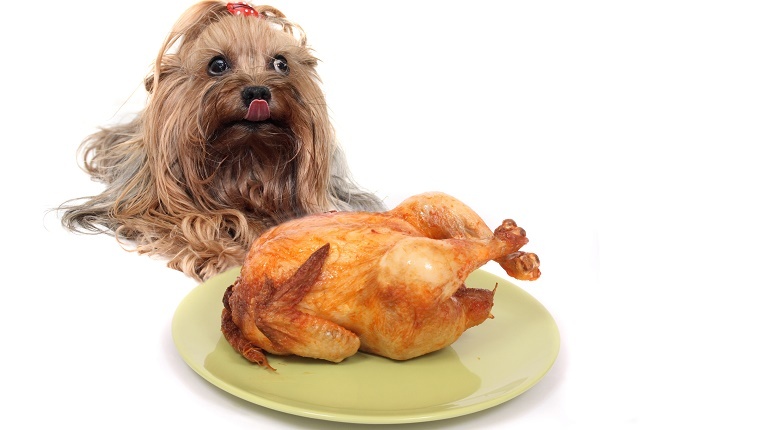 Here are 7 safe Thanksgiving-style recipes your dog can enjoy this holiday season! Turkey and sweet potatoes are both essential to a Thanksgiving meal. Let your dogs enjoy both with these safe Thanksgiving themed treats. Instead of sweet potatoes and marshmallows, your dog can chow down on sweet potato jerky treats. And if you have a group of dogs, a turkey loaf is the perfect family meal. This specially prepared doggy version of a turkey is not only delicious, but very healthy with ingredients such as carrots, kale, and pumpkin. Watch the video above for instructions! Pumpkin pie is the classic Thanksgiving dessert. Now, instead of giving up some of your pie and sneaking it to your pup, you can make them their very own doggy version. All you will need is some oatmeal to make the pie crust and canned pumpkin. The pumpkin should be completely natural with no added ingredients whatsoever. If you think about it, these pumpkin pie treats for your dogs are healthier than your own human version of pumpkin pie because their version has no sugar. Watch the video above to get started. This is a great way to use some of your leftover cooking materials that you’ve already bought to prepare your human Thanksgiving. You’ll need turkey, celery, peas, sweet potatoes, apples, and chicken stock–ingredients you will most likely have in the kitchen already because of Thanksgiving. The great part is that you can even save the leftover meatloaf in the freezer for another day you feel like treating your dog. Check it out in the video above. While your dog is a member of the family, dog owners know that eating Thanksgiving dinner can be a hassle if you own a dog. Every owner has sat at the table and suddenly felt a nose on the lap or a dog walking under the table looking for scraps. To keep them busy, fill a kong with this Thanksgiving sweet potato and turkey mixture. This is the perfect solution for keeping your dog a part of the Thanksgiving fun without them bothering your guests for food. The video above will help you out. While the kitchen can become quite busy and hectic on Thanksgiving, this easy recipe is simple to make for your dog alongside your human Thanksgiving dinner. All you will need is canned plain pumpkin, olive oil, oatmeal, brown rice flour, and yogurt. After creating your crust and adding the pumpkin, you can make the pie look like it has whipped cream by topping it with a dash of yogurt. Just remember to tell your guests they are for the dogs because they will most definitely look appetizing. Get started with the video above. While your dogs would probably love these treats year round, it’s fun to get in the Thanksgiving spirit with pumpkin flavoring. Make these pumpkin treats using flour, peanut butter, canned pumpkin, and eggs. Once you make the batter, you can cut them into any shape you like. If you are really feeling the holiday spirit, you can use mini turkey or pumpkin cookie cutters to be extra festive. Watch the video above to see how to make them. This is an easy recipe that lets your dog have their very own special version of a Thanksgiving turkey in the form of dog food. For this homemade recipe you’ll need oatmeal, turkey filet, butternut squash, quinoa, and organic brown flax seed. This turkey recipe is extremely healthy and it’s probably even healthier than your own Thanksgiving meal. While the final product may resemble dog food more than an actual turkey, we’re sure that your dog is probably only interested in the flavor anyway. Check it out in the video above. Do you have any Thanksgiving recipes for dogs? Let us know in the comments below!